The double election of Alexandru Ioan Cuza in Moldavia and Wallachia (respectively, 5 and 24 January 1859). Independence proclaimed on 9 May 1877, internationally recognised in 1878. The union of Romania with Bessarabia, Bukovina and Transylvania in 1918. 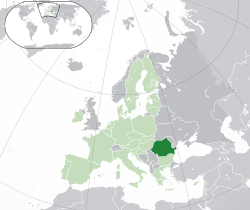 Monarchy was abolished on 30 December 1947 upon the proclamation of the People's Republic and was changed with the 1965 Constitution of Romania] upon its adoption on 21 August 1965 as the Socialist Republic. The Communist regime fell on 22 December 1989, the new democratic government was installed on 20 May 1990 and the new post-communist constitution was adopted on 21 November 1991. 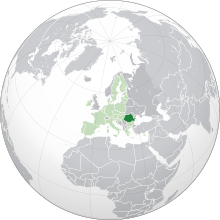 Romania joined the European Union on 1 January 2007. ↑ "Constitution of Romania". Cdep.ro. 7 September 2017 के ओरिजनल से पुरालेखित. पहुँचतिथी 2 अक्टूबर 2013. ↑ "Reservations and Declarations for Treaty No.148 – European Charter for Regional or Minority Languages". Council of Europe. Council of Europe. 8 December 2015 के ओरिजनल से पुरालेखित. पहुँचतिथी 3 December 2015. ↑ 3.0 3.1 "Romanian 2011 census (final results)" (PDF) (Romanian में). INSSE. 17 July 2013 के ओरिजनल से पुरालेखित (PDF). पहुँचतिथी 28 अगस्त 2012. ↑ 5.0 5.1 "Romania". International Monetary Fund. 3 January 2018 के ओरिजनल से पुरालेखित. पहुँचतिथी जुलाई 30, 2018. ↑ "Gini coefficient of equivalised disposable income (source: SILC)". Eurostat Data Explorer. 4 मार्च 2016 के ओरिजनल से पुरालेखित. पहुँचतिथी 8 February 2015. ↑ "2016 Human Development Report". United Nations Development Programme. 2018. 22 मार्च 2017 के ओरिजनल से पुरालेखित (PDF). पहुँचतिथी 20 September 2018.